Abduba Dida risks a block from the Presidential contest by IEBC. - Bana Kenya News, Real African Network Tubanane. 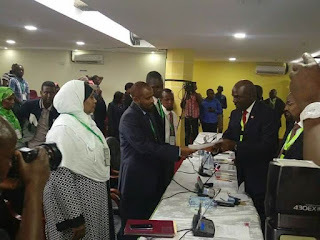 Home News Abduba Dida risks a block from the Presidential contest by IEBC. Abduba Dida risks a block from the Presidential contest by IEBC. Abduba Dida denied a chance of contesting for the presidency after IEBC claimed not to have their academic papers certified. The IEBC officials said that they need those papers to be certified before evening or else he will be blocked from contesting in the August polls. Abduda Dida a high school teacher contested in the last polls where he emerged position five. He was later employed by the Jubilee government to head CDF Kitty in Kenya. Dida comes when the country is faced with high inflation margin compared to 2013. Joe Nyaga and Raila Odinga were in the same office and cleared by the IEBC.